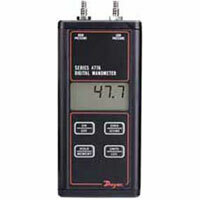 477B Dwyer Digital Differential Manometer Meter Series. The Popular New Dwyer Digital Manometer Series 477B is available with 0.1% full scale accuracy. The 477B contains a highly accurate differential pressure sensor that offers a 0.1% full scale accuracy on air ranges from 20" w.c. to 100 psid. Series 477B Handheld Digital Manometers are packed with features needed to make pressure measurements and recording faster, easier and more accurate than ever. Instantly select from up to nine of the most widely used pressure units without having to waste time and risk mistakes with tedious conversions. A non-volatile memory function enables storage of up to 40 readings - perfect for HVAC technicians making Pitot tube traverses of air flow readings across a duct. The 477B is also ideal for maintenance personnel or technicians that require a highly accurate standard to check their instrumentation or equipment to ensure proper performance. New Adjustable Damping Feature for Averaging Fluctuating Readings. Accuracy: ±0.10% of full scale from 60 to 78°F (15.6 to 25.6°C); ±1% of full scale from 32 to 60 and 78 to 104°F (0 to 15.6 and 25.6 to 40°C). Temperature Limits: 32 to 104°F (0 to 40°C). Display: 0.42" (10.6 mm) 4 digit LCD. Resolution: See model/range chart below. 477B-1: 0-20.00" w.c. plus bar, psi, "Hg, kPa, mmHg, mbar, mm w.c., Pa. Max press. 3 psig. Ships from stock. 477B-2: 0-40.00" w.c. plus bar, psi, "Hg, kPa, mmHg, mbar, mm w.c., Pa. Max press. 3 psig. Ships from stock. 477B-3: 0-200.0" w.c. plus bar, psi, "Hg, kPa, mmHg, mbar, mm w.c. Max press. 15 psig. 1 to 2 weeks. 477B-4: 0-10.00 psi plus bar, "w.c., "Hg, kPa, mmHg, mbar, mm w.c. Max press. 30 psig. 1 to 2 weeks. 477B-5: 0-20.00 psi plus bar, "w.c., "Hg, kPa, mmHg, mbar. Max press. 60 psig. 1 to 2 weeks. 477B-6: 0-30.00 psi plus bar, "w.c., "Hg, kPa, mmHg, mbar. Max press. 100 psig. 1 to 2 weeks. 477B-7: 0-100.0 psi plus bar, "w.c., "Hg, kPa, mmHg, mbar. Max press. 200 psig. 1 to 2 weeks.